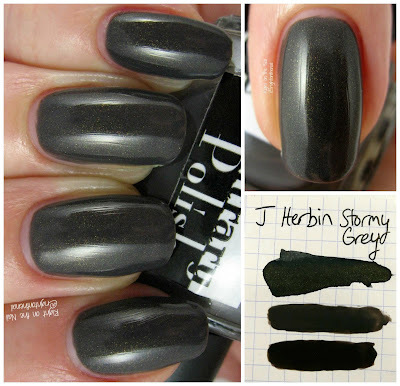 Right on the Nail: Nibs & Nails Presents Contrary Polish in Stormy Grey (inspired by J Herbin Stormy Grey Ink) | Swatches and Giveaway! Nibs & Nails Presents Contrary Polish in Stormy Grey (inspired by J Herbin Stormy Grey Ink) | Swatches and Giveaway! Hi guys! Welcome back to yet another week of Nibs & Nails where we ask indie polish makers to dupe or simply be inspired by popular fountain pen inks with shimmer or sheen. There's still a few hours left in the Great Lakes Lacquer giveaway, and both polishes are now for sale in their Etsy store. Go purchase the duo for $15 or individually for $8.50. Tonight we invite a new brand to the blog...I've wanted to purchase from Contrary Polish for a long time, so I'm super thrilled to be able to work with Carrie. If you know anything about Contrary Polish, you know that she can rock a shimmer polish. Up until now we have only looked at the ink brand Diamine, but there are other companies on the shimmer and sheen bandwagon. J Herbin is a French company and they were the first company to release an ink with shimmer and it's called Stormy Grey. I love grey polishes, and I love shimmer, so you can only imagine excited I am about this polish! Carrie was kind enough to provide a second polish for a giveaway, so stay tuned to the end of the post to enter! As always, my husband has thoroughly reviewed J Herbin's Stormy Grey ink on his blog called Inkdependence. Let's get a better look at the ink and polish, shall we? The gold shimmer in the ink stands out so much more than the polish (this is a common theme every week). I thought that the matte version would be closer to the ink, but the matte topcoat makes the base a bit too light. The normal finish is pretty much an exact dupe of the ink if you ask me. Another great job by a polish maker! Stormy Grey is a deep charcoal grey crelly with lots of gold shimmer. The gold in here is more of a bronze gold than a yellow gold finish. I think it would look gorgeous with silver shimmer as well. You will need 2-3 coats for full coverage, depending on your nail length. I used 3 coats, but if you have short nails you could probably be safe with 2. The formula was pretty fantastic if I do say so myself. It's weird how much the color changes with a matte topcoat, right? Unlike the past few weeks, the matte finish didn't make the shimmer stand out more with Stormy Grey. With this polish, I would stick with a shiny topcoat. Well, I think I need to go and buy some more Contrary Polishes immediately! You can purchase all of their polishes in mini (0.17 fl oz, $5) or full (0.5 fl oz, $10) sizes on their website. As I said above, there's yet another giveaway! Good luck! I can't say I have a favorite pen brand, but I know I loved playing with calligraphy and inks my mom had when I was a kid! I'm afraid I'm an office-supply pen kind of girl - anything with purple ink :). I do not have a fave, but I use BIC more often than not.